London [UK], Nov. 14 : Former England skipper Steven Gerrard has once again added fuel to the speculations of him leaving the LA Galaxy. Gerrard's contract with the LA Galaxy finishes in December, with formal talks over a new deal expected to begin once the club's fate in the MLS play-offs is determined. Gerrard had signed an 18-month deal with the MLS side in January 2015 and there are no suggestions from either side that he will be going for a renewal. Gerrard, in his last appearance for the LA, had seen his side lose on penalties to Colorado Rapids. London, Jan 02 : Former England player and Liverpool captain Steven Gerrard is reportedly set to leave his boyhood club when his contract expires at the end of the season. Gerrard, who made his Liverpool debut in 1998, reportedly will not be moving to another English club and is wanted by clubs in the US, the BBC reported. Jamie Carragher, Gerrard's former Liverpool and England team-mate, took to twitter saying that it was a sad day for Liverpool and English football and it was the right decision after considering all things. London, Dec 03 : Steven Gerrard marked his Liverpool return by scoring as his club came from behind to beat bottom club Leicester 3-1 in their Premier League clash on Tuesday. The hosts led when Leonardo Ulloa's shot hit the post, then bounced off the back of keeper Simon Mignolet 's head. But Liverpool equalised as Adam Lallana netted four minutes later after Rickie Lambert's knock down, before Gerrard slotted in from a poor Wes Morgan clearance in the 54th minute. Morgan was sent off for a foul on Lambert, then midfielder Jordan Henderson sealed a deserved win for Liverpool, The BBC reported. London, Sep 17 : Steven Gerrard's late penalty got Liverpool back into the Champions League football by defeating Bulgarian champions Ludogorets Razgrad. According to the BBC, after a low-key first half, the Reds took the lead in the 82nd minute when Mario Balotelli held off two defenders and poked home his first goal for the club. Meanwhile, substitute Dani Abalo ensured a point for Razgrad after he rounded Simon Mignolet and scored a goal. Milan Borjan, the debutant goalkeeper of Razgrad ended up giving Liverpool a spot-kick after he fouled Javier Manquillo in the second minute of stoppage time. London, July 22 : Wayne Rooney is emerging as the favourite to become the new England captain after Steven Gerrard quit international football last night. Gerrard called time on a glorious England career that saw him win 114 caps to become one of the true greats of the game. The Liverpool star, 34, admits he did a lot of soul-searching before deciding to stand down following a heart-to-heart talk with his wife Alex and former colleagues, including David Beckham. London, Apr 27 : Liverpool captain Steven Gerrard would have nearly swapped his home team for Chelsea nine years ago if he had gone ahead with a decision that reportedly rocked English football temporarily. Media reports have revealed that shock and anger had swept across the club fans as Gerrard had handed in a transfer request at Liverpool, which he joined at the age of eight, on July 5 2005 after leading the club to Champions League glory just six weeks ago. Gerrard has described that day as the 'most emotional' day of his life in his autobiography, the Guardian reported. Johannesburg, Dec 25 - England and Liverpool captain Steven Gerrard has hailed his Anfield teammate Luis Suarez as the best player in the world on current form. In 12 appearances this season, the Uruguay striker has scored 19 goals to fire Liverpool to the top of the Premier League and his prolific streak has earned him a new long-term contract at the club where he has overcome widespread misgivings after several controversial incidents. London, Nov 25 : Liverpool skipper Steven Gerrard has said that after the disappointing Champions League exit, he wants the Liverpool to win the Europa League. Liverpool crashed out of European football''s biggest tournament despite beating Debrecen 1-0 in Hungary, but the 29-year-old insists they can go some way to healing the pain by going all the way in the Europa League. "Of course it''s disappointing, we played fantastically well tonight and despite getting three points, we don''t progress," The Sun quoted Gerrard, as saying. London, Nov. 18 : Liverpool skipper Steven Gerrard, who has recently recovered from a groin injury, has said that he is fully fit to take on Manchester City in the Premier League this weekend. "I felt very tired after the (Birmingham) game as I wasn''t really ready to return. I''d done very little training in the three weeks beforehand," The Telegraph quoted Gerrard, as saying. London, Nov 5 : Liverpool skipper Steven Gerrard has admitted that he is still devastated by the sale of Xabi Alonso, who went to Real Madrid for 30 million pounds. The Kop skipper also said he cannot get used to seeing Michael Owen in a Manchester United shirt. Midfielder Gerrard, who missed last night’s Champions League clash against Lyon with a groin injury, said Alonso’s departure is the key reason behind the Reds’ struggles so far this season. London, Oct 24 : Midfielder Steven Gerrard has emerged as Real Madrid’s top target for next summer with club president Florentino Perez all set to launch an audacious 30 million pounds bid for the Liverpool skipper. 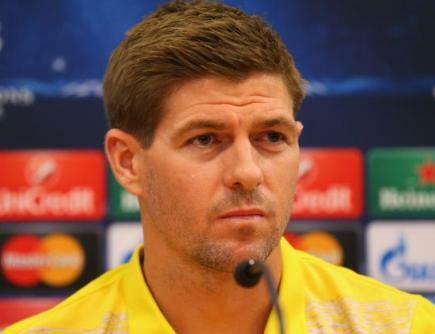 “It’s no secret Gerrard is a player Perez and technical director Jorge Valdano admire. There is a shortlist for next season and Gerrard is the first name on it,” a top Madrid source said. 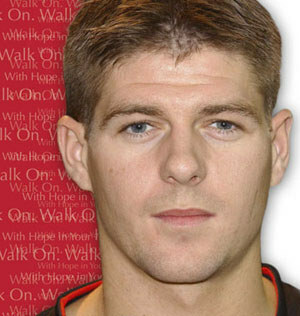 London - England midfielder Steven Gerrard was ruled out of Wednesday's World Cup qualifier against Belarus on Tuesday. The Liverpool captain suffered a groin injury during Saturday's 1-0 defeat in Ukraine, and was unable to train on Tuesday. "He didn't finish training because the pain was the same as on Monday," said England manager Fabio Capello. "He's going back to Liverpool." Goalkeeper David James is also a doubt after missing Tuesday's training session. London, Oct. 7 : Liverpool skipper Steven Gerrard says he is proud to be nearing his 500th club appearance, but adds that his real target is a Premier League winner''s medal. Club skipper Gerrard has played 494 games for the Reds, scoring 123 goals, and could play his 500th match away at Lyon next month. London, Aug 13 : Steven Gerrard believes that Manchester City could be Premier League title challengers this season. The Liverpool captain said: "They have made everyone sit up and take notice. They're definitely going to be gunning for that top four." "And looking at the standard and quality of players they have brought in, they might even be capable of pushing on for the title if it all clicks together for them," The Sun quoted Gerrard, as saying. London, July 20 : Liverpool star Steven Gerrard is due to appear at a Liverpool Crown Court to face trial over his alleged involvement in a nightclub scuffle. The England midfielder faces a single charge of affray, the Daily Star reports. It is alleged that Gerrard, 29, was involved in a brawl that saw businessman Marcus McGee, 34, lose a tooth and sustain facial cuts. 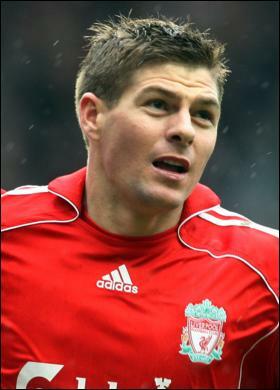 London, June 17 : Liverpool midfielder Steven Gerrard has said that he will hang up his boots in 2013. "I''ll be 33 at the end of my contract and it''s doubtful whether I''ll carry on. If I decide to stop, I will be proud of the fact I''ve spent my entire career with the same club," The Sun quoted Gerrard, as saying. Gerrard's contract with Liverpool will end in 2013, and he has admitted that he is unlikely to seek an extension when it expires. London, Apr. 18 : Steven Gerrard will miss Liverpool's crunch clash with Arsenal on Tuesday as he is down with a groin injury. Gerrard suffered a recurrence in the Reds' final training session before the game, preventing him from even taking a place on the bench. He may be even in doubt for the trip to Hull four days later. London, Apr. 4 : Liverpool FC captain Steven Gerrard has signed a new 26 million pound contract, which will see him playing for the club for the rest of his career. According to The Sun, the Kop skipper, 28, agreed a two-year contract extension, taking him to 2013, and will see his wages rise nearly 20,000 pounds to around 125,000 pounds a week. Boss Rafa Benitez said: "It is a very, very positive message to the players that we have the commitment of Gerrard, which means we can go forward and can concentrate on football. London - Liverpool captain Steven Gerrard has committed his future to the Premier League club by agreeing to extend his contract for a further two years until 2013. Liverpool said on their website on Friday that the 28-year-old is expected to sign the deal "soon." The agreement is a major boost for the club, who are chasing league and Champions League honours this year. The news comes hot on the heels of the new five-year deal signed by manager Rafael Benitez last month. London, Mar. 25: England football star Steven Gerrard is ready to commit himself to a new long-term contract at Liverpool, saying he has never been happier in his career. Captain Gerrard believes Rafa Benitez can restore the Reds to the pinnacle of English football and wants to see out his playing days at the club he has idolised since boyhood. Liverpool will approach Gerrard, 28, in the summer about extending his 110,000-pounds-a-week deal, which has two years left to run.